The DL:RP Series continues with another inspiring alumni account, written by WFU Magazine’s Carol L. Hanner. 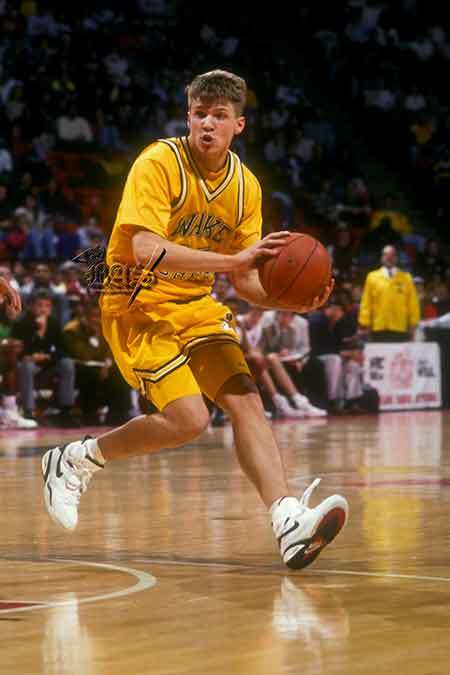 Marc Blucas (WFU ‘94) came to WFU on a baskteball scholarship, earned a business degree, then banked left for Hollywood. Slam dunk. On paper, Marc Blucas says, he never should have made it to where he is now. Blucas (’94) was a small-town boy from Butler, Pennsylvania, who played basketball on scholarship for Wake Forest, graduated with a business degree and played abroad, but he soon set his course toward law school. He also had a partnership with NASCAR great Dale Earnhardt Sr. to start a company advising professional athletes on contracts, endorsements and financial planning, with the help of Bern Beatty (P ’88), now a professor emeritus of business. But it worked. He has a successful acting career. He plays the romantic interest of star Robin Tunney in a TV legal drama called “The Fix,” which premieres tonight on ABC. When we talked, he was in Connecticut, working until 4 a.m. every night in the bitter February cold for a Christmas special for Hallmark Movies, where he has had multiple starring roles. He has acted in numerous movies alongside such stars as Mel Gibson and Katie Holmes and in many TV shows, including “Buffy the Vampire Slayer,” where he played Riley Finn. Blucas lived for about 14 years in Los Angeles but moved seven years ago to a 15-acre farm in rural Pennsylvania, where he lives with his wife, Ryan Haddon Blucas. She is a former producer who recently turned years of volunteer counseling into a practice as a hypnotherapist and life coach. They live with their two daughters, 4 and 7, and Ryan’s two teens from an earlier marriage. Blucas gets his workouts through chores and renovating their 300-year-old farmhouse, which he much prefers to slaving in the gym in L.A.
Tax credits and technology dramatically changed the industry, he says. “It used to be just Harrison Ford could leave town and live somewhere else.” But Blucas says in his last six years in Los Angeles, he filmed there only one day because his locations were spread out across the globe, from Atlanta to Capetown, South Africa. He met Ryan in L.A., and she, too, was ready to move to the East Coast to be near family. Today, they have a rule — no more than two weeks apart, even if it means Blucas flies home for just a day. “My family’s always going to be more important to me than my career, and right now my kids are at an age where they want to be around me.” He even negotiated to appear in fewer episodes of “The Fix” to ensure that he had time off to go home. He got a call from a casting director who flew him from his hometown to Los Angeles for his first big audition, for “Jerry Maguire,” the 1996 film starring Tom Cruise. Blucas didn’t get that part, but he got enough encouragement to keep his focus, dedication and work ethic revved up.